The Ruth Galloway series falls squarely in the ‘equivalent of curling up under a blanket with my feet encased in ugg boots and a hot chocolate close by‘ territory for me. I have adored Ruth from her first appearance and now, in what is strongly rumoured to be her penultimate outing, reading one of ‘her’ books feels more like catching up with an old friend than the average reading experience. While this makes it a mostly enjoyable thing for me to indulge in I can’t help feeling that later volumes of this series must be pretty inaccessible to new readers. Like watching a random episode of Coronation Street without prior knowledge of all the who’s-been-sleeping-with-who shenanigans. That caveat aside I thought the CHALK PIT was Griffiths back to her best form after what were, for me, a couple of lacklustre installments. 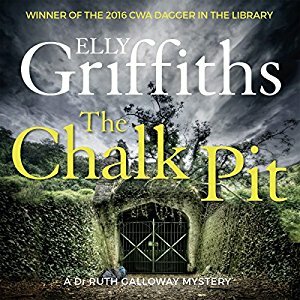 The storyline of THE CHALK PIT is well-constructed and quite fascinating. Some bones are discovered in one of the many tunnels under the city of Norwich where an entrepreneur is planning to open an underground restaurant. Enter archaeologist Ruth Galloway to uncover the secrets of these bones. Then a homeless man reports that one of his fellow rough sleepers has gone missing and he is worried about her. DCI Harry Nelson treats the report with the dignity and seriousness it deserves (but probably wouldn’t get in the real world) but even so is limited in the resources he can assign to the case. However when a young mother who doesn’t inhabit society’s fringes goes missing there is a full-scale investigation. There’s a real social conscience here as the novel explores the issue of homelessness but there’s also loads of jolly good drama which includes the introduction of the possibility of entire communities living underground. But readers of this series are at least equally as interested in the characters as they are in the stories. Ruth and Harry are both at their humorous best here even though they both have some heavy things going on their personal lives. Or perhaps it’s because of those personal struggles that both turned up the humour as a kind of defence mechanism against the world’s ills. I particularly identified with Harry and his workplace woes on this occasion as he struggled with a new boss demanding he be more strategic as I share Harry’s preference for doing ‘real’ work. And the realistic depiction of Ruth coming to terms with her parents’ frailties hit a nerve too. I must admit to finding the pair’s relationship twists and turns a bit overdone by now (certainly by the very end of the book) but it’s one of the things I choose to forgive in return for the rest of the series elements I do enjoy. There is less Cathbad than normal in this novel but it was nice to see his partner, police officer Judy Johnson, take centre stage in the investigation. I enjoyed seeing a new side to this previously overshadowed character. I can’t seriously recommend this book to anyone who’s brand new to the series because so much of it concerns the personal lives of the main players and understanding all of that relies heavily on having read the earlier books. But for fans, or those who might have let the series lapse from the reading lists a book or two ago, this is a must-read. If you are an audio-book listener I can highly recommend Jane McDowell’s excellent narration. Very glad you enjoyed this as much as you did, Bernadette. I really like this series very much, too, too, and it’s interesting (to me) how there are things you forgive in a much-loved series that you wouldn’t in another. I’m the same way. I hope we aren’t coming to the end of the series. Yes, the next is the 10th, and probably final, book. There were some cliffhangers in this book involving Harry and Ruth’s relationship, which should be resolved in the next book. And that should resolve their relationship and those of some others closely related to them. On top of this, the plot was very interesting and unique. I’ve never heard of nor read about people living underground, nor have I read about those underground rooms as part of churches. It is interesting. Although I suspect the next book is the final one, I will still be in a post-good-book slump after I read that one. I’ll miss Ruth Galloway and her friends, and the beautiful scenery which is so well-described in these books. And, yes, I have looked up salt marshes around Norfolk, as well as a number of places mentioned in this book. I will miss Ruth and Harry and Cathbad and all the rest too Kathy. Even though I’m a bit tired of the on/off romantic entanglements I really enjoy these characters and their view of the world. But I can understand an author wanting to leave readers wanting more rather than wishing for less (as I do with some authors such as Elizabeth George). Oh I love this series, and will be devastated when it finishes. Harry is my favourite policeman, Ruth and Harry are my favourite fictional sleuthing pair, and I wish Cathbad was my friend. Surely they will appear on TV sometime – I think they would be ideal (though I’d complain about them not being exactly as I imagine them). The actor Mark Rylance is probably far too important to play Cathbad now, but Elly G once Tweeted that he was Cathbad to the life: I had read the same interview with him as she had, and I agreed totally, he has exactly that air of total weirdness… in a way that makes you doubt your own reasonable rational ways.